Increasing evidence has revealed the major enzymes-involved in Arabidopsis and maize wax/cutin synthesis; however, there is limited information about the genes-associated with wax/cutin synthesis in rice. Here we report the characterization of an ethylene response factor gene in rice. This rice wax synthesis regulatory gene 1 (OsWR1) is a homolog of Arabidopsis wax/cutin synthesis regulatory gene WIN1/SHN1. Transcript analysis showed that OsWR1 is induced by drought, abscisic acid and salt, and is predominantly expressed in leaves. Functional analyses indicated that overexpressing OsWR1 (Ox-WR1) improved while RNA interference OsWR1 rice (RI-WR1) decreased drought tolerance, consistent with water loss and cuticular permeability, suggesting that OsWR1-triggered drought response might be associated with cuticular characteristics. In addition, OsWR1 activated the expression of the genes-related to oxidative stress response and membrane stability. Gas chromatograph–mass spectrometry analysis further showed that OsWR1 modulated the wax synthesis through alteration of long chain fatty acids and alkanes, evidencing the regulation of OsWR1 in wax synthesis. Detection with real-time PCR amplification indicated that Ox-WR1 enhanced while RI-WR1 decreased the expression of wax/cutin synthesis related genes. Furthermore, OsWR1 physically interacted with the DRE and GCC box in the promoters of wax related genes OsLACS2 and OsFAE1’-L, indicating that OsWR1 at least directly modulates the expression of these genes. Thus our results indicate that OsWR1 is a positive regulator of wax synthesis related genes in rice, and this regulation, distinct from its homology regulator of WIN1/SHN1 in cutin synthesis, subsequently contributes to reduced water loss and enhanced drought tolerance. Youhua Wang, Liyun Wan, Lixia Zhang contributed equally to the article. The online version of this article (doi: 10.1007/s11103-011-9861-2) contains supplementary material, which is available to authorized users. 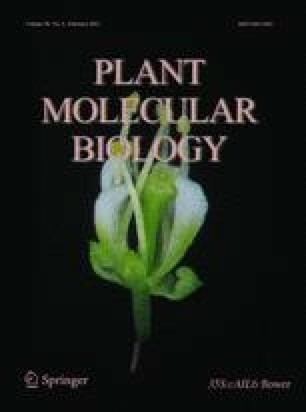 This work was supported by the National Science Foundation of China (30730060 and 31172025) and Grant Special Foundation of Transgenic Plants in China (2009ZX08009-020B and 2008ZX001-003). We are grateful to International Science Editing for improving the text.